We all know that the blockchain is used to exchange bitcoins, ether, and other kinds of cryptocurrencies. But that’s just the tip of the iceberg of what this technology is capable of. New blockchain applications are getting invented every single day. People are coming up with unique and exciting ways to use this new technology to radically transform our world as we currently know it. Dealing with bureaucracy is never fun, no matter what country you come from. It’s inefficient, slow, and can often be costly. Luckily, the blockchain is allowing us to change all that. OriginalMy, a startup from Brazil, offers multiple blockchain-based applications specifically designed to decentralize bureaucracy and take out the middleman. They offer proof of authenticity for digital documents, such as statements, proposals, and reports. Any digital document can have its existence proven through a time stamp provided by a public blockchain. Contracts can also be securely registered and signed on the blockchain. Proof of Existence was created by a 23-year-old developer in Argentina. It is essentially a super-secure notary public service available for anyone on earth to use instantly. No longer do you need to find someone to notarize your documents in person. Smart contracts are really transforming the way we do business of all kinds. The days of manually filling out heaps of forms with expensive lawyers or brokers could soon be over. Now we can exchange money, property, shares—anything of value—all on the blockchain in a secure, transparent, fast, and safe way. 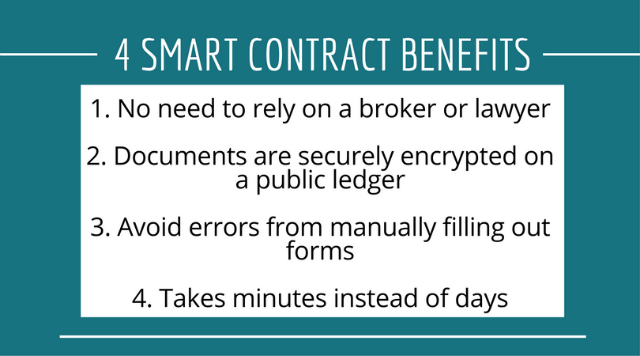 Smart contracts only complete the terms of an agreement once both parties have fulfilled their end of the bargain. The documents are encrypted on an insured ledger, so they could never be lost by anyone. Smart contracts are going to streamline so many situations in our lives that are normally a huge headache — insurance premiums, breach contracts, property law, credit enforcement, legal processes, and more. Right now, if you were a migrant worker that had to send money back to your family, you would have to take time out of your day to go to Western Union, pay a hefty fee, and your family wouldn’t see that money for up to a week. Now imagine that you could just pull out your phone, send the funds through an app, and your family can instantly receive it either in their bank account or through a teller that will come directly to their doorstep and give them cash. This is exactly what Abra has managed to do using blockchain technology. They never even physically take possession of the money themselves, the way PayPal and Venmo do. Everyone in the Abra system always holds their own money, without even needing a bank account. 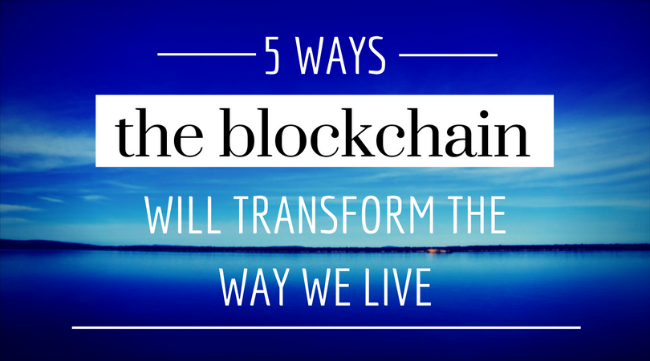 The blockchain is also helping radically transform the global banking industry itself. Right now, it takes at least a few days to transfer money internationally between two banks. But using blockchain technology, Ripple figured out how to do it in mere seconds. Now banks all over the world are joining in droves to improve their cross-border payment capabilities, including Santander, UniCredit, UBS, and American Express. Thanks to the blockchain, we will enjoy faster transaction times and lower banking fees. The way governments currently collect taxes ends up costing them a lot of time and money. But they could be using the blockchain to implement, track, and receive taxes in real time. In fact, China’s government recently announced that it is going to “utilize blockchain technology for social taxation and electronic invoice issuance matters.” It’s going to be very exciting to see how that plays out, especially considering China is the world’s largest economy. If it goes well, other governments could follow suit. There are many benefits to using the blockchain for tax collection purposes. Since the system provides clear and transparent information and transactions, it would make errors and tax fraud much easier to detect. People to be more likely to pay their taxes since it would be much more probable that they would get caught for tax avoidance. Musicians rarely get paid properly for their songs and albums these days. Large corporations like Sony and Spotify are sucking up all the profits while the people that actually put in the work and talent are getting pennies. Artists could upload their albums to a blockchain application with smart contracts in place to protect their rights. If an individual, radio station, television show, or digital service provider (like iTunes) wanted to use it, they could agree to certain terms, send payment directly to the musicians and producers through the blockchain, and instantly have rights to use it as per the agreed terms. This doesn’t just have to apply to musicians, either. Artists, journalists, inventors—they could all take advantage of blockchain technology to take out the middlemen and directly get compensated for the things they create. Another example is Stream. This platform is revolutionizing the online video industry. They aim to properly compensate video creators, in an effort to end giant intermediaries like YouTube receiving the overwhelming majority of the profits. As an increasing amount of platforms utilize blockchain technology, more and more creators will become empowered with artistic and financial agency. As we have unfortunately seen time and time again — most recently with the massive Equifax hack — our personal data is highly vulnerable in online databases in their current form. Facebook, Google, PayPal, Visa: these big companies own all of our information and make huge profits off of it, at our expense. If our data was on the blockchain, we would have direct control over it. You could limit the amount of data you share, presenting just the minimum amount required that any given party needs to identify us. Privacy is a key component in the foundation of a free society. Using the blockchain, we can hopefully reclaim a bit of our freedom by taking back the rights to our personal data so that the control is in our hands instead of intermediaries.